Siberian Huskies are a medium-sized, strong, graceful, and tenacious sled dog. They are a handsome dog, energetic and dignified. While they are a medium sized dog, they are extremely strong, able to pull light loads at moderate speeds for long distances. The AKC holds the copyright to this Standard and has refused permission for its reproduction here. Please consult their publication The Dog Book for full details. The Siberian Husky was originally developed by the Chukchi people of northeastern Siberia as an endurance sled dog. They were also used to herd reindeer. In 1909, the first large numbers of these Chukchi dogs were brought to Alaska to compete in the long-distance All-Alaska Sweepstakes races, and the Alaskan dog drivers quickly recognized the ability of these small, compact dogs from Siberia. In the winter of 1925, when a diphtheria epidemic broke out in the isolated town of Nome, Alaska, a relay of dog teams brought life-saving serum from distant Nenana. This heroic endeavor earned national prominence for the drivers and their dogs. One of these drivers, Leonhard Seppala, brought his team of Siberian Huskies, descendants of the original imports from Siberia, to the United States on a personal appearance tour. While in New England he competed in sled dog races and again proved the superiority of Siberian Huskies over the native dogs. The New England drivers and pioneer fanciers acquired foundation stock, earned AKC recognition for the breed in 1930, and founded the Siberian Husky Club of America in 1938. The Siberian Husky is a comparatively easy dog to care for. He is by nature fastidiously clean and is typically free from body odor and parasites. Siberian s clean themselves like cats. In fact, a Siberian that becomes soiled with mud will clean himself up. Therefore, bathing requirements are minimal. In fact, most owners bathe their dogs once per year or less. Twice a year, Siberians “blow” their undercoats, that is, they shed their undercoats completely. It is a very intense shedding period that can last three weeks or more from start to finish. The good news is that this only happens twice a year. The remainder of the time, Siberians are relatively shed free. Some people feel that this periodic problem is easier to cope with than the constant shedding and renewal of many smooth-coated breeds. The bad news is that the shedding period can be rather messy. The hair comes out in large and small clumps. Lots of vacuuming and brushing are in order. It should be noted, however, that this shedding “schedule” is climate dependent. Some owners that live in very warm climes, ones that lack clearly defined “seasonal changes,” report some shedding year round in the breed. Other than during coat-blowing season, the Siberian needs very little grooming. No trimming or shaving of hair is required or recommended. Just occasional brushing to remove dead hair and keep the coat fresh and shiny is required. Their nails should be checked and clipped periodically, and their feet should be checked regularly to ensure good health, particularly in actively working dogs. The Siberian Husky has a delightful temperament, affectionate but not fawning. This gentle and friendly disposition may be a heritage from the past, since the Chukchi people held their dogs in great esteem, housed them in the family shelters, and encouraged their children to play with them. The Siberian Husky is alert, eager to please, and adaptable. An aggressive dog is not a team dog, and therefore a lousy sled dog. Siberians are an extremely intelligent and independent breed. They can be very stubborn, owing to their original purpose, and they are easily bored. This independent and stubborn nature may at times challenge your ingenuity. His versatility makes him an agreeable companion to people of all ages and varying interests. However, this is not a breed that is typically recommended for first-time dog owners, as mistakes are easy to make and sometimes difficult to fix with this remarkably intelligent and opportunistic breed. While capable of showing strong affection for his family, the Siberian Husky is not usually a one-man dog. He exhibits no fear or suspicion of strangers and is as likely to greet a would be thief as warmly as a trusted family member. This is not the temperament of a watch-dog, although a Siberian Husky may unwittingly act as a deterrent to those ignorant of his true hospitable nature, simply due to his intense personality and appearance. 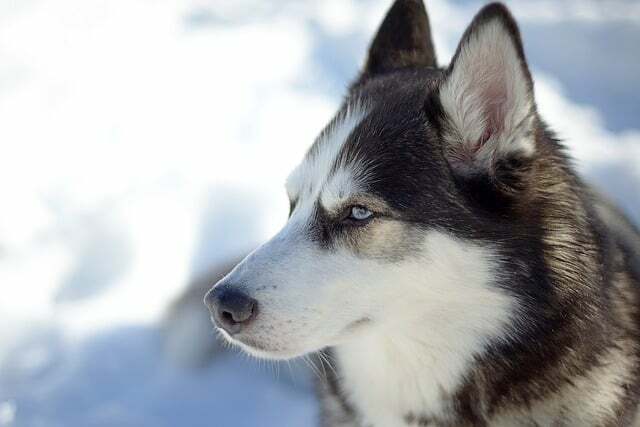 Due to the increasing popularity of the breed, many Siberians are being bred without proper consideration of the special characteristics outlined here that make the Siberian Husky a unique breed. If you plan to purchase a puppy or older dog, please take into account this temperment summary. Siberians that show these temperament characteristics are good representations of the breed, and make excellent companions. Siberian Huskies are rather quiet dogs. They do not typically bark. They do talk, however, in a soft “woo woo woo” sound. They can also howl quite well. Owners of multiple Huskies report frequent howling, starting and stopping simultaneously. Since the Siberian, like other northern breeds, is a very pack oriented animal, this behavior is typical. When you collect your puppy, your breeder should tell you what the puppy’s diet has been to date, as well as a recommendation as to the best food and feeding frequency in the future, both for while the dog is still a puppy as well as when the dog is an adult. You should try and follow the puppy’s diet at the time you collect him from the breeder as best you can until the puppy is settled into its new environment. Then you can gradually change the diet to suit your preferences. Remember that sudden changes in diet can severely disrupt the puppy’s digestive system and cause gastric distress. The Siberian requires a relatively small amount of food for his size. This trait may be traced to the origins of the breed, as the Chukchis developed their dogs to pull a light load at a fast pace over great distances in low temperatures on the smallest possible intake of food. As for the type and “brand” of dog food, basically, any reputable dog food manufacturer provides a dog food that is sufficient to keep a dog healthy. However, the premium brands of dog food have the advantage that one can feed the dog less and still get very good nourishment. In addition, stool size and the amount is generally less with the premium dog foods. Keep in mind that feeding dogs is partly art, and partly science. The dog food manufacturers have done the science part. The rest is up to you. Some people feed their dogs a mix of canned and dry food twice a day. Others feed only dry and allow free feeding, and so on. Be sure and pick a frequency of feeding, brand, and type of food to suit your dog’s needs. For working Siberians, a “performance” formula is in order. For Siberians that go for walks and hikes, a “maintenance” formula is usually best. Consult your breeder and veterinarian for advice. One other thing worth mentioning here is how long to feed puppy food. Some research indicates that feeding puppy food for too long can increase the incidence of hip dysplasia in dogs that are susceptible to it. Some breeders start feeding adult food very soon. Even though the Siberian is not fully mature until 18 months, most people gradually switch to adult dog food at the 8-10 month time frame. Again, this is something to discuss with your breeder and veterinarian. Siberian Huskies are happiest when they can share in family activities. The best arrangement is one in which the dog can come in and out of the house of its own free-will, through a dog door. If a dog door is not possible, then training the dog to go to an outside door to be let out is also very easy to do. Outside, the dog should have a large, fenced yard. The fence should be strong and at least 6 feet tall. It is also a good idea to bury wire in the ground to discourage digging out. Siberians are notorious diggers. It is usually best to set up a sand box somewhere in a shaded part of the yard and encourage digging there, if possible. Siberians should not be allowed to roam around the neighborhood. If one chooses to kennel a Siberian, the kennel should be chain link, with a concrete run, and should be 6 to 7 ft wide and 10 to 15 ft long. It should be at least 6 ft high with chain link across the top of the kennel. It should be in a shaded location and have an insulated dog house with a door for shelter from the elements. Because the Siberian is an arctic dog, it can remain outside in very cold weather. However, it should be provided with shelter from the elements in the form of a good sturdy house. The house should have a flat roof, as Siberians love to lay on top of their houses and observe the world. A well-insulated house with nice straw bedding is perfect for Siberians that spend most of their time outside. Heating the dog house is usually not necessary. Training Siberian Huskies can be a challenge. They are an extremely intelligent, energetic, and stubborn breed, and one must be ready for the unexpected. Training should start when the dog is young. You should work to establish the rules of the house early, and make sure that the puppy knows that you are in charge. For example, if you do not want the dog on the bed as an adult, do not allow it as a puppy and never give in, even once, or the dog will think that all rules are flexible. The rule of thumb is that if you train a dog to do something, expect him to do it. Therefore, if the puppy learns that certain things are allowed, it will be difficult to train them not to do them as adults. Since the dog is pack-oriented, it important to establish yourself as the head of the pack, or alpha, very early. Once you do this, the dog will respect you and training will be much easier. It is very important to understand the distinction between establishing yourself as alpha and bullying the dog into submission. These are not the same thing! The former is simply a communication that the dog needs and expects, while the latter is very negative and detrimental to the dog’s well-being. By establishing yourself as the leader of the pack early, your dog will learn to respect you and look to you for guidance and will know where the boundaries for acceptable behavior lie. It is best to enroll in a puppy training class (or puppy kindergarten training as they are commonly known) soon after your dog is home and has all of its vaccinations. This training is good for the dog and for you as the owner, as it will help you understand your new puppy and establish you as alpha very early in the puppy’s life, which is important with this breed. Once you have completed the puppy class, and have been working with the dog for a few months, a basic obedience class is in order. Obedience training this breed can be very interesting and extremely challenging. Many owners will complain that their dogs act perfectly in class, but will not obey at home. This breed is intelligent enough to differentiate situations very well and will apply different rules of behavior for different situations. You must stay on top of the dog and maintain control, which is easier to do while the dog is of manageable size than with a stubborn, energetic adult that has been allowed to get away with undesirable behavior for a long time. It is very important to remember that the Siberian Husky is a working breed. His heritage has endowed him with the desire to run and his conformation has given him the ability to enjoy it effortlessly. Because of this, it is important that no Siberian ever be allowed unrestrained freedom. In addition, most Siberians have a strong predator drive that can translate into trouble. This is usually directed toward neighborhood cats, birds, rodents, and other small animals. For his own protection, he should be confined and under control at all times. Since he is a working dog, he must be given something to do. Exercise may be obtained in the leash, at play, and best of all, through mushing. Siberians make wonderful hiking companions, and with a dog backpack, can carry food and water. Above all, if you feel that it is inconvenient or cruel to keep a dog confined and under control like this, then the Siberian Husky is not the breed for you. The Siberian Husky is a remarkably healthy breed. When well cared for, the Siberian is relatively “maintenance free”, outside of normal checkups and vaccinations. The incidence of hip dysplasia in Siberians is fairly low. However, breeding Siberians should, among other things, be OFA (Orthopedic Foundation for Animals) certified prior to breeding. OFA certification cannot be granted prior to 24 months of age. Conscientious efforts of breeders have kept the incidence of this condition low in the Siberian. According to CERF, the incidence of cataracts in the breed checked by ACVO veterinarians is around 15-18%. The actual incidence is probably higher as many long time breeders discover the anomaly in young dogs early and never certify them. With the typical cataract, the dog’s vision is not usually substantially affected, and they lead a full, happy, albeit it neutered life. However, a more aggressive cataract also exists, which progresses quickly and may cause blindness by 2 to 3 years of age. Corneal dystrophy is also present in the breed. This disease causes diffuse and progressive vision loss in mid to older age. It is often not present or detectable until age 4 to 6 years, at which time the dog could easily have produced a few litters and perpetuated the problem. Glaucoma is also present in the Siberian, particularly in some specific racing lines. Glaucoma causes the animal significant pain and vision loss usually before it is detected by the owner. Progressive retinal atrophy (PRA) and central progressive retinal atrophy (CPRA) have appeared in a number of breeds, including Siberians. These problems are genetically caused. Careful screening of potential breeding pairs has helped reduce the incidence of these problems in the breed, and the current incidence of PRA is relatively low. Obviously, Siberian owners and breeders should regularly check and clear eyes through CERF prior to embarking on a breeding program. Are Siberian Huskies part wolf? No. The Siberian Husky is a domesticated pure bred dog and has been for many centuries. They are sometimes mistaken for wolves, and they are sometimes used in movies to depict wolves, but they are most certainly not wolves or part wolf. Why are some Siberian noses partially pink and partially black? This is called a “snow nose”, and is fairly common in the breed. A snow nose is a reddish or pink marking on a black or liver colored nose. Snow nose can disappear over warmer months and reappear over the winter months. There is nothing wrong with a snow nose, and it is perfectly acceptable in the breed. Can Siberians have different colored eyes? Yes. This is fairly common in the breed. One eye may be blue while the other is brown. Is there something wrong with an eye that is both brown and blue? No. This is called a “pinto eye”, a “parti eye”, or a “split eye.” It is also fairly common in the breed. One or both eyes may be all blue with a brown pie shaped wedge or all brown with a blue wedge. At first glance, it may appear that there is something wrong with the eye but there is not. It is simply a matter if pigmentation. This too is perfectly acceptable in the breed. I’ve heard that Siberians are mischievous. Is this true? Yes and no. Siberians are very intelligent dogs. They will often do things that surprise their owners. They can get into things that one might think are impossible. When Siberians are bored, they can become quite mischievous, inventive, and destructive. This is typical of working dogs. This is why it is so important to include the Siberian in family activities and give him plenty of attention and exercise. I’ve heard that Siberians are high-strung. Is this true? Yes and no. Siberians are a very energetic breed. As a working dog, they need something to do, some way of challenging their intelligence and an outlet for their energy. If they are not provided one, they will find one for themselves. I’ve heard Siberians are dumb. Is that true? No! Siberian Huskies are extremely intelligent working dogs. People often mistake the fact that they can be difficult to train as a sign of stupidity. One must keep the Siberian interested and challenge his intelligence in order to properly train him. A Siberian will probably know what you want him to do, he just may not want to do it! Just how cold can a Siberian Husky live in? Siberian Huskies can work and live in temperatures as low as 75 degrees Fahrenheit below zero. As stated repeatedly throughout this document, Siberian Huskies are remarkably adaptable animals. So long as they have adequate shade, shelter, and water, the seem to do just fine in warmer climates. See next question. I live in a hot part of the country. Will this be uncomfortable for my Siberian Husy? The best approach to this problem is to select a dog from a reputable breeder in your area or that lives in an area with a similar climate to yours. These dogs will be well aclimated to the warmer weather than a Siberian Husky from a cooler climate. However, so long as the dog is well taken care of, brushed regularly, has plenty of water and shade, he or she will likely be just fine in your warm climate. Siberian Huskies are found all over the world, from the deep southern part of the United States, where it is very warm and humid, to South Africa, Russia, New Zeland, Austrailia, and Alaska. Literally all over the globe in every climate you can imagine. My Siberian Husky digs constantly and is destroying the yard. What can I do? Digging can be a very difficult problem to solve. It is the nature of the breed to dig cooling holes to lie in. One method that has worked occasionally for me is to provide the dog an area in your yard in which he is allowed, even encouraged, to dig and train him to dig there. A sandbox, of sorts, with soft cool dirt with an occasional treat buried there can work. My Siberian Husky puppy is very noisy, particularly at night. What can I do? This is not particular to the breed, but since I get asked this question all of the time, it is worth repeating the answer. The noisy puppy at night is simply lonely. He needs to be near his “pack,” which is you in this case. One easy method is to use a crate at night with your puppy and put the crate next to your bed. When your puppy wakes and whines, you can easily reassure, or in some cases “rattle” the cage, to quiet the dog. This is also an effective house training technique. For more information on crate training, see k9web.com. My Siberian Husky puppy seems to be potty training very slowly or not at all. What can I do? My Siberian Husky is an escape artist. He constantly gets out of the yard. What can I do? This too is a very simple problem to solve. Siberians can be mischevious, and as a result can be notorious escape artists. The best solution to this problem is an electrified wire at the top, and or bottom of your fence, depending on the problem (digging or climbing or both). You can obtain a cheap, low power, electric charger at any home improvement store. I have two solar powered ones. The shock they produce is very small, sort of a strong static electric shock, and the dogs absolutely hate it. I have a very short fence where I live now (4 ft in some areas), with several gaps at the bottom that would take any of my dogs seconds to dig out. My Siberian Husky howls all day long, annoying the neighbors. What can I do? This too is a simple problem to solve. This problem should be approached in a series of stages. Stage 1 is to use simple negative reinforcement when the dog makes unacceptable noise. This must be done repeatedly, every time it happens, for several days. Stage 2 is to step it up by employing a willing, perhaps the annoyed, neighbor to help. Have him squirt the dog with water when the noise happens. Most Siberian Huskies hate water. You could also employ any number of devices on the market designed to apply a squirt of water when a noise happens. I have never used one, but it should work. Unfortunately, it will not be able to distinguish between your dog making noise and a loud car, so your dog may receive negative reinforcement when it is not warranted. All of these methods, if applied with patience and vigilance, should work. I have not tried stage 2. I have had stage 1 work most of the time but occasionally have had to jump to stage 3, the bark-activated shock collar. These deliver up to eight different levels of shock to the dog when barking occurs, at adjustable levels of sensitivity. The shocks are similar to the electric fence above. I’ve been told that Siberian Huskies are “cat killers.” Is this true? They can be. It depends on how they are socialized as puppies. They have a very strong prey-drive, and if they are not socialized to smaller animals as puppies, they will likely kill most small animals they encounter (rabbits, squirrels, cats, etc). I have a newborn/small child. Is he/she safe around my Siberian Husky? It is never a good idea to trust any dog around a small child unsupervised, no matter how docile the dog (and child) seem. Be extremely careful and supervise the dog and child. Gradually introduce the situation to both to make them both comfortable. This advice has nothing to do with the Siberian Husky breed in particular. Are Siberian Huskies genetically pre-disposed to suffer from Epilepsy (seizures of unknown origin)? No. However, Epilepsy does occur in the breed. The seizures are not, generally speaking, life-threatening, but if your dog does have a seizure, you should have your dog checked by a veterinarian to rule out the many other possible causes. If, in the end, Epilepsy is the diagnosis, seizures are usually controllable with medication (Dilantin or Phenobarbital are usually prescribed).